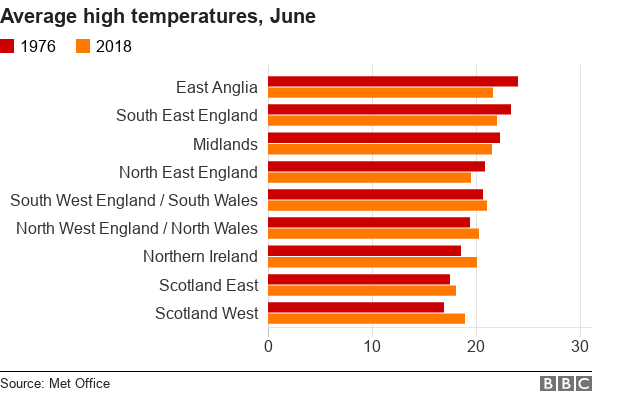 The UK's summer heatwave affected its potato crop. - Late frosts in 2017 cost apple growers 25 percent of their crop. - Heat reduced carrot harvests 25-30 percent in 2018. - Heat also reduced onion harvests by 40 percent in 2018. - Potato yields fell 20 percent in 2018 in England and Wales, the fourth smallest harvest since 1960. - Bad weather in Spain and Italy led to shortages of zucchini, spinach and lettuce in UK supermarkets in early 2017.